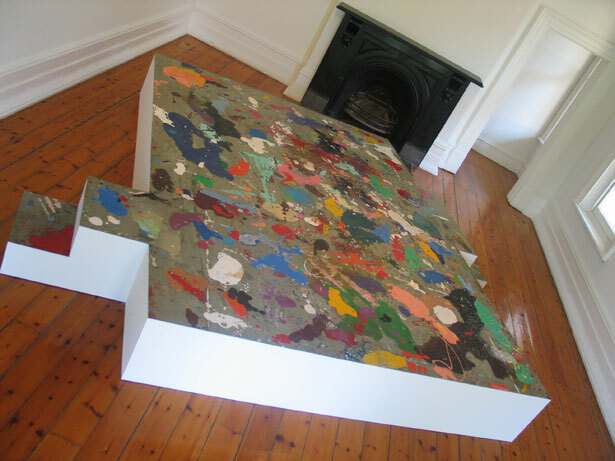 Studio Floor was created for the group exhibition Flash, curated by Geoff Newton and Jan Duffy, at Linden – St Kilda Centre for Contemporary Arts, Melbourne. Studio Floor is a work that has come about as a result of other works. Over the past year and a half I have been making a series of abstract ‘drip’ paintings, collectively titled Square. 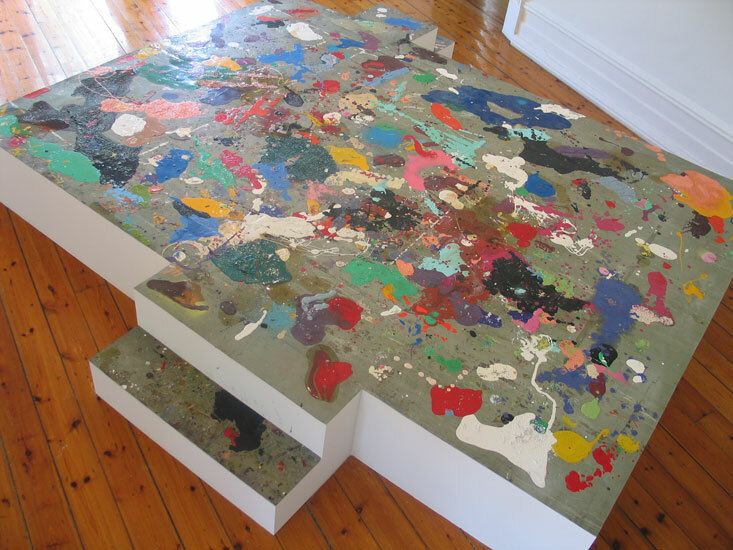 Over the course of this period the linoleum floor in my Docklands studio has developed a rich and colourful surface – an artwork in itself. For Studio Floor, I have extracted a section of this well-worn floor, which would have witnessed a whole history of cargo and shipping negotiations, being the office floor of the now crumbling and pigeon infested “Shed 21”. 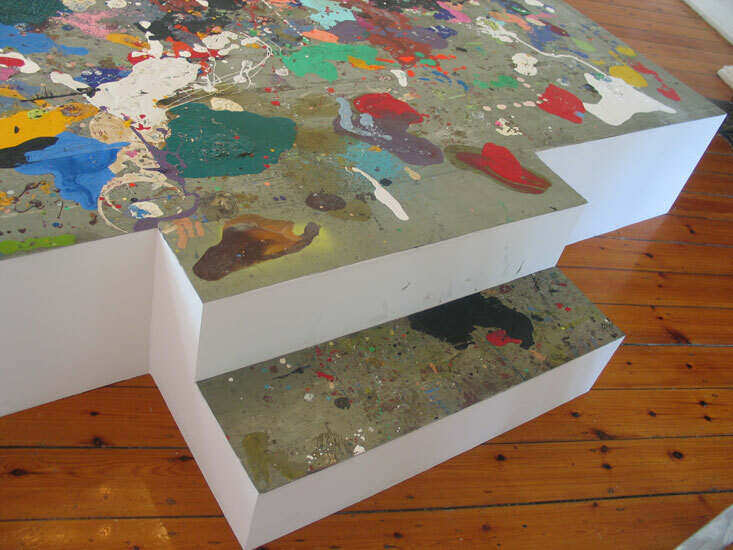 Placing it into the gallery, onto a platform elevates its status from worthless, rotting floor to high art object. 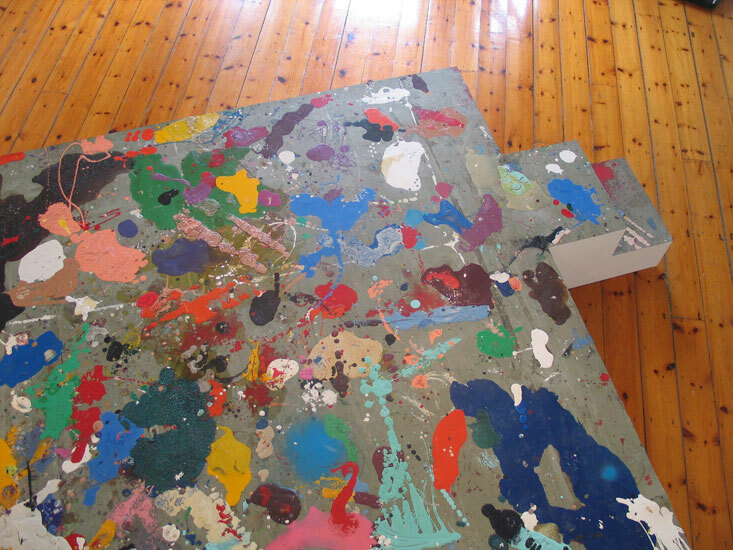 The work invites the viewer to step up and onto the splattered floor, thus enjoying the ‘painted’ surface in an unconventional way, whilst also experiencing a museum-like, clichéd sense of ‘The Artists’ Studio’. Studio Floor presents a blur between painting, sculpture, architecture and installation. It also touches on the concept archival systems, and observes the obsessive-compulsive act to make something out of a by-product of a by-product of a by-product.